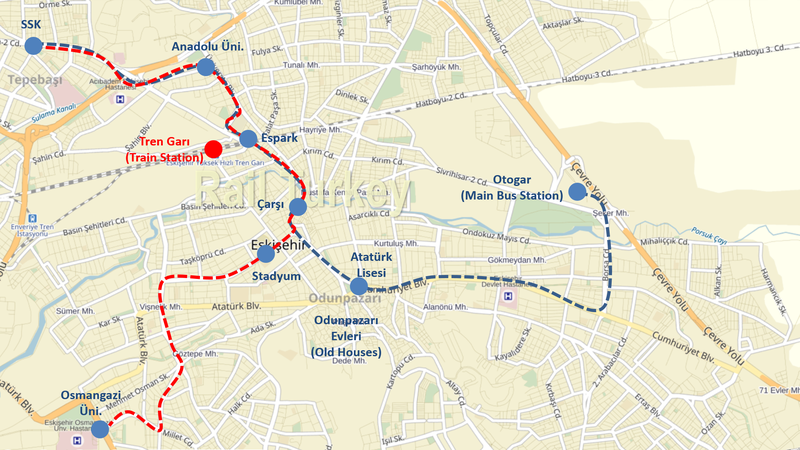 Two lines of Eskisehir’s award-winning tram system (Estram), SSK-Osmangazi and SSK-Otogar, is passing through Espark. Each lines has a frequency of 13 minutes and trams run from early morning to late night (Click for tram timetable). Thanks, Onur. Very interesting and useful information. It is a shame, however that EsTram doesn’t actually call at the station, especially for passengers with luggage, etc. You’re welcome. I did it first for myself, and then shared in Rail Turkey. And it’s really sad not to have a more encouraging tram stop. While the new tunnel section was being built, there used to be a level crossing between the trams and the main line from Eskisehir to Ankara, near the current Espark tram stop. This was controlled by a man with a flag; when the bell rang to say a main line train was coming, the man with the flag would emerge from his hut and flag down any trams to a halt, until the main line train had passed. It was quite bizarre to travel on a YHT and see trams waiting to cross immediately after you passed! This unusual operation ceased once the new tunnels opened.